I’ve read My Family and Other Animals countless times. Durrell’s funny and exuberant memoir of his childhood on Corfu is resplendent with lush descriptions of places, of people, of animals, and of food. He describes spending his days exploring the olive groves and swimming in the ocean, stopping to visit his neighbours whenever he felt hungry and snacking on “a bunch of amber grapes still sun-warmed, some figs black as tar striped with pink where they had burst their seams with ripeness, or a giant water-melon with an inside like pink ice.” It is one of my favourite books, not least because of Durrell’s obvious enthusiasm for food. Although I almost never use grapes in my cooking, a little while ago I stumbled across this lovely grape dish on My Name is Yeh and mentally bookmarked it. On the afternoon that I decided to make it a few weeks back, I only had an hour or so before the kids woke up and couldn’t actually be bothered to scroll through Molly’s blog to find the recipe. So instead I riffed off of what I remembered. And it turned out too lovely not to share. 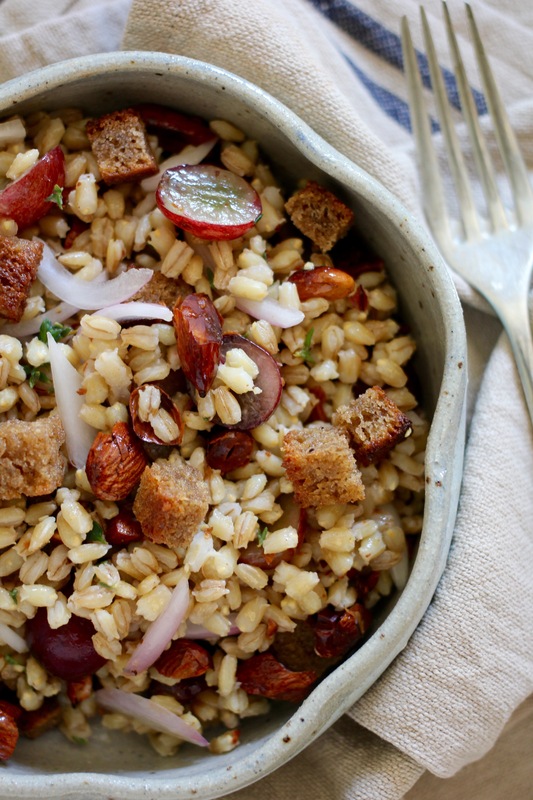 I’m all about the toothsome nutty heft of barley in my salads lately, and found it paired beautifully with the sweet juicy grapes, the bite of the onion, the nutty crunch, and the lemony dressing. This dish feels both simple and special at the same time. You should make it. This dish is a riff on this one from the delightful Molly Yeh. It is simple and delicious and pairs beautifully with a piece of baked fish (if you swing that way), or a simple spinach salad. It also holds up well in the fridge for a few days, although be sure to add the croutons just before eating to keep them crunchy. 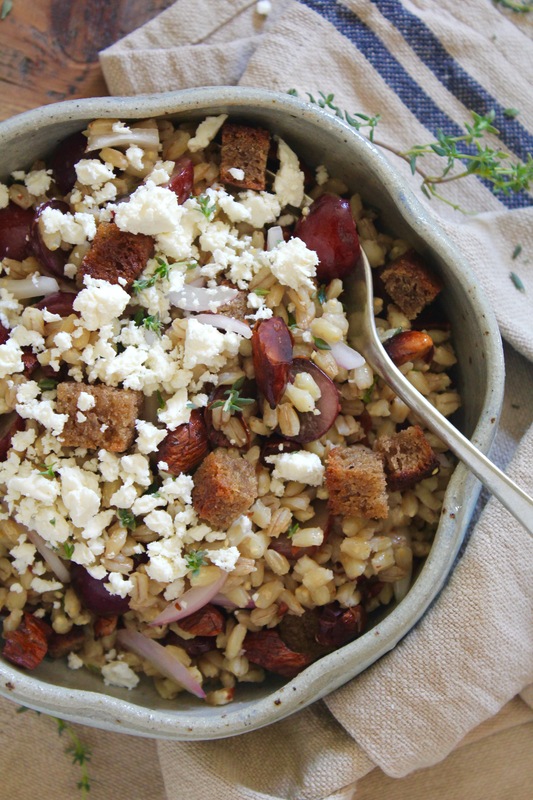 Combine the barley along with one and a half cups cold water in a small pot. Cover, bring to a boil, then lower to a simmer and cook until all of the water is absorbed (approx. 20 minutes). 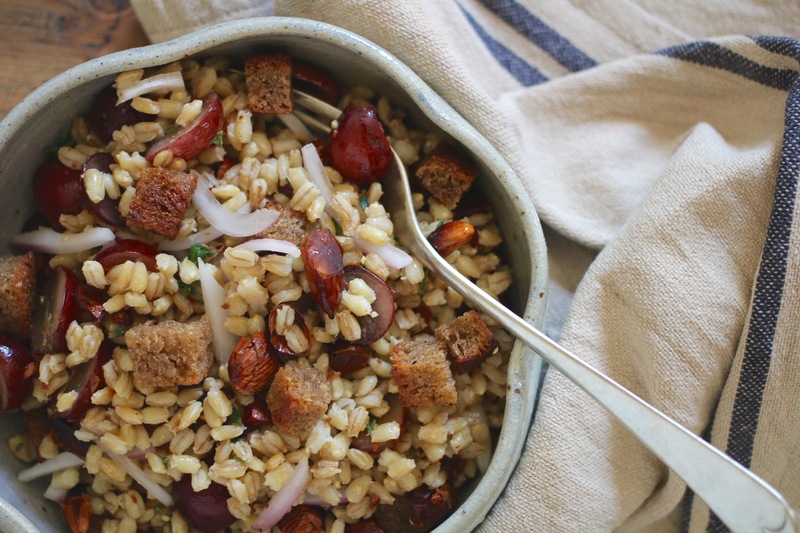 The barley should be tender but still chewy. Using either a mortar & pestle or a food processor combine the lemon juice, olive oil, thyme leaves and roasted garlic cloves until a thick dressing forms. Set aside. Peel the onion and thinly slice. If the grapes are small leave them whole, otherwise slice in half length-ways. Roughly chop the roasted almonds. 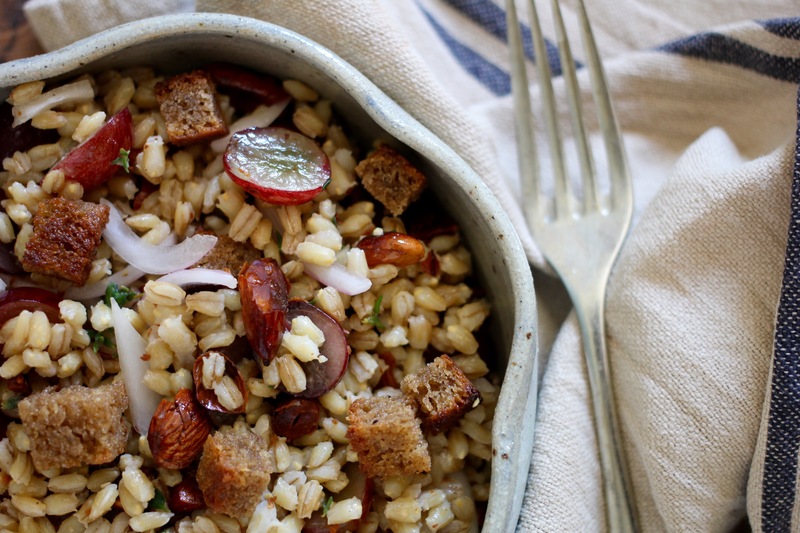 Cut the slice of rye bread into cubes and toast in a pan over a medium-high heat with just a splash of olive oil. Toss continually until the cubes start to evenly brown. 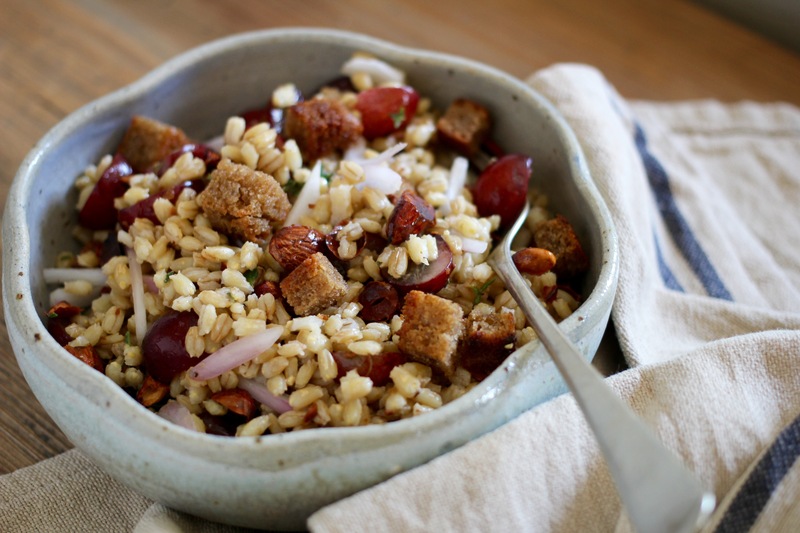 In a large bowl combine the barley, the onion, the grapes, and the almonds. Stir through the dressing, then add the croutons and feta (if using) just before serving. Sounds like such a great combination! What wonderful flavors to combine. Grape pound cake sounds interesting! I love grapes in salads but rarely throw them in. 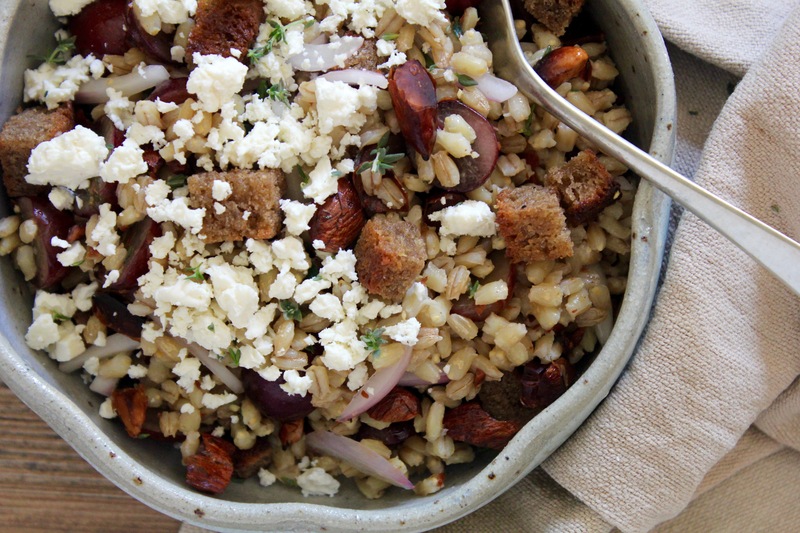 The pairing with thyme, red onion, and feta here looks really good. And I want to check out this book as well – sounds like good bedtime reading. Yummy and so pretty too! What a lot of gorgeous things going on here – taste (obviously), texture and colour. I haven’t read My Family and Other Animals in ages but you have made me want to trawl in an old secondhand book shop and find it. Lovely recipe. Fan of Molly’s too. PS I came over via Katie at Whole Nourishment. HI Kellie – it’s one of those books that is easy to find at secondhand book shops and so worth reading. And let me know how the recipe goes if you end up making it. Lovely to e-meet you!